Transformation seems to be a bit of a running theme for me this month! Case File #75 over at CSI this week was full of those gorgeous pastel colours which I LOVE the look of but always struggle to actually work with for some reason - I pull out all these beautiful papers and trinkets and trims and then manage to turn it into a big porridgey mess! 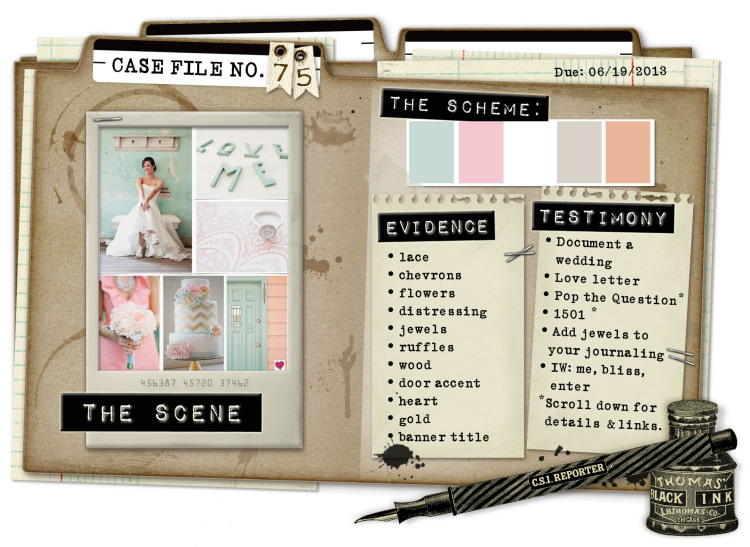 Here's the Case File in all its pastel prettiness - perfect! 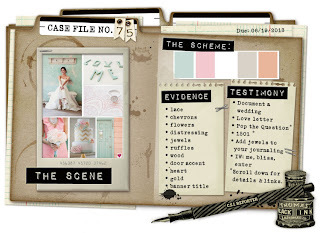 For further help in solving the Case, you can download the CSI Coordinates - these are free printable patterned papers, images and journaling spots designed especially for each Case File by the amazing Michele Singh. And here is my solution to the case - a porridgey mess which I couldn't even manage to photograph very well ... tsk ... I had a lovely time with it though! The Evidence: lace; chevrons; flowers; distressing; jewels; ruffles; wood; door accent; heart; gold. The Testimony: I documented our home-made wedding - when you open the door, there is a photo of the marquee all ready for our wedding picnic. Months of planning and creating, culminating in several hours of hard work with a dedicated group of wonderful friends had transformed a slightly dodgy-looking hired marquee into the magical scene I had imagined and there was a moment when we all suddenly paused for breath and saw what we had created ... the journaling reads "With a lot of hard work and help from our friends and a sprinkling of magic, at last the unpromising hired marquee was transformed into the vision of loveliness which I had imagined - don't you just love it when a plan comes together? <3 x"
Here are some pictures of my evidence under the magnifying glass! One of the many hearts on this page! Pink mesh from a veg bag I squirrelled away years ago!